It would seem ... that somebody's not happy with us. Under normal circumstances we'd be a bit more conciliatory about offending other people's sensibilities (no.. really, we would...) - but - as promised a while back - after 4 years of this stuff - we've truly had enough of the cavalier, indifferent attitude to truth and diligence that has characterised EA senior management's monumentally self regarding approach to discharging their statutory duties as public servants in the matter of water licences at Avoncliff. We do not make public allegations that we cannot evidence and that are gratuitously defamatory and we take gross exception to people acknowledging wrongdoing, promising to do something about it and then reneging on those promises multiple times no doubt in the hope/intention that time will dim down the issue and "normal" operations will continue unaffected . OK - here's the response...! In view of some things that have come to light in the comments = it looks like time that somebody with an actual mandate to settle things from the EA side of this had better be dispatched down to Wiltshire dragging his/her/their battered EIIR briefcase(s) with them. There is more woe rumbling down the tracks for officials at the EA and they still have the possibility to avoid a messy train crash. Who is the named junior member? I haven't noticed any names on this blog that is a junior EA member, certainly not a junior member who has been "targeted". As for the accusation placed against staff that have behaved dishonestly and abused their position, does this not make each one a "liar and corrupt" as one commenter/this blog has put? Having worked inside the EA, I can say this doesn't surprise me. No doubt these named staff have been kicking up a fuss inside, and with everyone in it together (the interconnected web of abuse, dishonesty and poor practices), senior management have no choice but to defend lower staff in order to cover themselves. Perhaps less time worrying about a simple mention of a name and more time improving the culture and procedures would be a better use of resources, as I advise at Inside the EA. Besides, if these are truly false accusations, prove it I say. Some staff seem to be spending too much time here and at Inside the EA rather than working - again, no surprises there. Would not like to forget PENNY SOWTER she said we cannot run the water wheel .Another lie join the merry bunch. So here is the deal. Pay your fee WE the [ENVIRONMENT AGENCY} screw you over lie deceive and give your licence to a buddy. THAT IS THEFT. My advice is forget any hydro and save the £150,and save the public purse in time of need over ONE MILLION POUNDS. The communication director and others have a lot to answer to . I like the point by David Jordan in his letter which clearly states that "As an employer the EA has a duty of care for all employees including their health, safety and wellbeing". This is most laudable and almost touching. What the EA also has is a responsibility for the Environment (something there in the name I think). What the EA also has as a non-governmental organisation, a qango, is the duty to operate within the laws of this fair island. The EA has admitted that it has acted unlawfully. That put simply means that some members of the EA staff broke the law. One of the basic principles is that an employer should not condone or assist in the execution or perpetuation of a wrongdoing. No EA member of staff has been disciplined so far. The saga continues which tends to indicate that those corporately responsible for the EA condone the unlawful acts and seek to perpetuate them. Any improvement in the environment that would have been realised by the project has been put back at least 4 years. 4 years lost CO2 savings. 4 years without improved fish passage. 4 years without the use of renewable energy (so much for government targets). It also seems to miss David Jordan's limited view that the unlawful acts and general mendacity of the EA have probably had a serious negative effect on the stress levels experienced by the Earl's and all associated with the scheme. How about their health and wellbeing, is it not the EA's responsibility to act in an open and transparent manner with no detriment to the general public. Duty of care come to mind. Lack of care seems to closely associated with the EA. It would also appear that David Jordan, having risen to the lofty heights of Director of Operations, knows little about blogs except for that he does not like honest comments which reveal the EA and its unlawful acts for what they are. Have I mentioned unlawful acts enough yet to make the point? My limited view of the situation is that the EA should act lawfully with openness and transparency and determine the license application as it should have been in February 2010. The should stop wasting taxpayers money and stop trying to drag this out until people lose the will or financial capability to continue. David Jordan face up to your responsibilities. Fantastic link about the EA, more amusing and informative than Henry!!! Wotcher gonna do now then? After all this hassle, and Weevers is up for sale? If the EA was doing it's job properly, Avon Cliff would be operating with it's licence and Weever's may be positively doing something else. Now, millions of pounds later, neither is the case. I wish this was the only case I have seen, but there are countless up and down the country, perhaps not as higher waste (more like the lost of thousands to hundreds of thousands), but it all adds up and it affects real lives. Not only is Weevers Mill up for sale but there is no mention of hydro power in the supporting sales documentation - or any mention for that matter of the property's liability for the mechanical integrity of the weir insofar as that is covered by the ownership laid out in the deeds. Quite a turn of events really. I must concur with anonymous. He's always been a figure head with no real power, more a protector of staff than anything else. He's certainly not known for anything other than positive PR and strategic political planning for the EA (read greasing leading DEFRA minsters with falsified statistics). 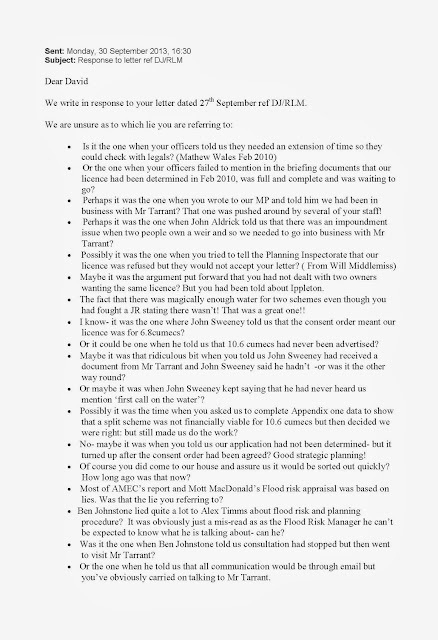 oh yes that really worked DAVID the response was reasonable must be a job requirement lying to the public..
As an ex-employee of the Environment Agency I can only commend the originator of this blog for the brave action they are taking in exposing a situation that has for far too long been hidden from the public eye. I urge politicians and all who believe in the environment to read very carefully what is being written here. A great deal of what is being said rings true and is not just the views of one disaffected employee. In my experience the EA management encourages a culture where bullying of staff and the public is rife. Anyone who complains is treated with total ruthlessness by the management despite the many years of service they may have given to the Agency and to the environment. In 2001 Alan Dalton who was a member of the Agency’s national board sent a 29 page dossier to Michael Meacher, the environment minister outlining cases of stress among employees and poor management practices. In my experience the situation after that time got worse and not better and it would seem continues until the present day. Google Environment Agency and bullying an Mr Meacher's report is always there. Other examples of internal abuse of staff papper the search results together with other victims of the culture extant at the EA. One might have some sympathy for a regime that instituted very strong controls and sanctions on errant officials - but it's abundantly clear that is not the case with the EA. 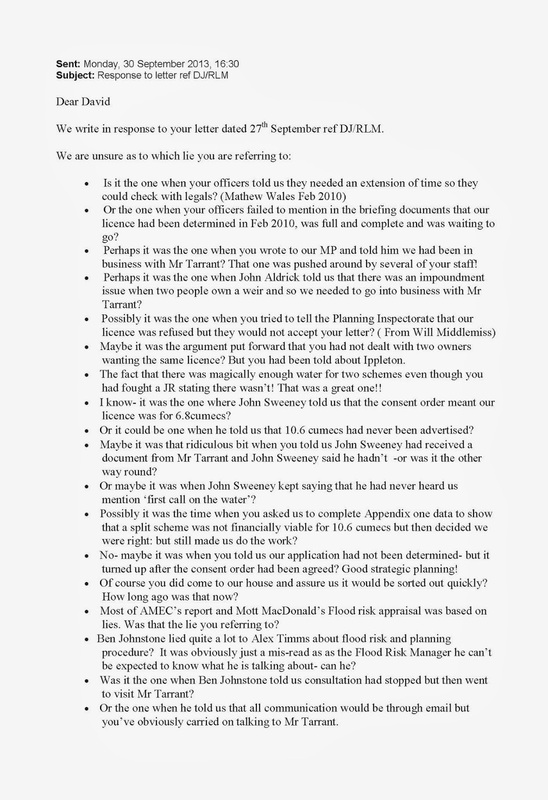 It is true the agency should no better it is clear they have created a monster by the wrong doing at avoncliff , instead of backing off they make this worse with letters from high up agency managers to the very people they have wronged. The tone of his letter shows clear contempt towards Northmill and bias against them and this from a director means no fare decision is capable of been made. David Jordan makes vague reference to what his minions have been up to and gets back 20 instances (and more that didn't immediately spring to mind ) back - where they've erred or worse - looks like he should have stuck to apology and delay - oh, yeah - that didn't work out did it? WOW THE MOST HITS EVER ON THIS SITE so much interest just in the last post . I think the penny is dropping for many people. Websites and blogs like ours is beginning to open up the EA like never before. The EA has always espoused transparency, but during my time there, it was never practised - more lip service than anything else. 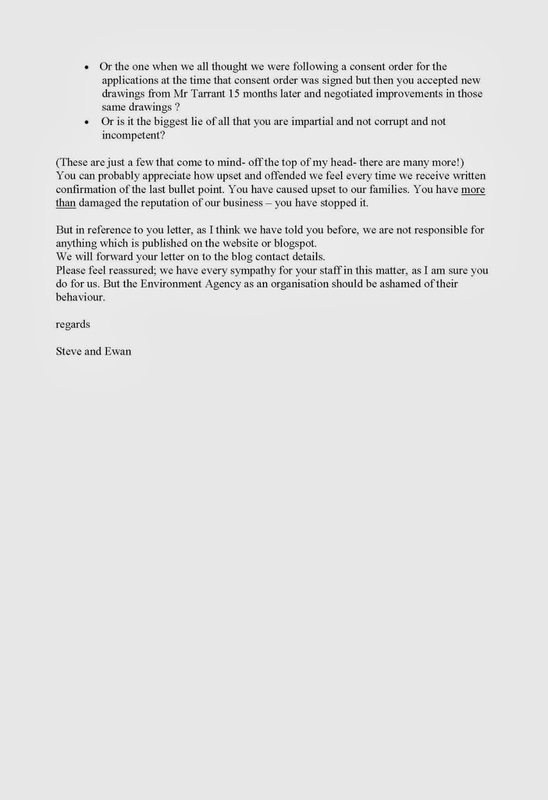 Inside the EA is now listed on the second page of Google search for "Environment Agency" and the documents I have built up about the waste, bullying, harassment, victimisation and mismanaged have been sent to over a dozen MPs. We can only hope that, after the millions of wasted tax payer funds, perhaps there maybe a silver lining to these shenanigans through the light it has cast. One can only hope. surely OWEN PATTERSON has knowledge of all this waste? How about some of the below getting their hands dirty ? Scratch that - seems the website has dropped down the listings for now. Fact is, the word is getting out, both online and offline. There are now many links coming back to inside the EA, and I am sure it is the same for this Avon Cliff blog. Many people have been isolated and unsure of what to do with the incompetence of the EA. Now that people are becoming more vocal, more and more are gaining courage to also say something. Wrongdoing is one thing - cover up is quite another. 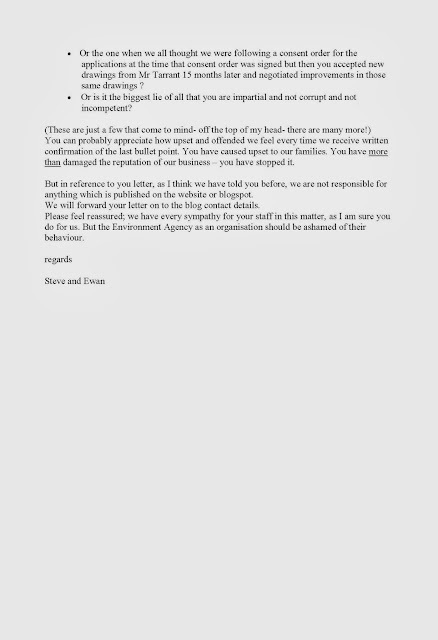 We understand that considerable PR effort has been expended by the EA in the matter of Avoncliff keeping the matter out of the mainstream media with only tidbits like the libel threat to Narrowboat World coming to light. We know that the EA has been out and about suggesting editorial policy to the copy 'n pasters of their press releases. Looks like muzzling people with uncomfortable things to say extends to the highest reaches of gubmint - Owen Patterson has been banned from tweeting by DEFRA - how does that work - if he's da boss? Some positive news in the press about the EA for once (http://www.endsreport.com/41255/environment-agency-job-cuts-bigger-and-quicker-than-expected#!). Seems the message is actually beginning to sink in with ministers. I find it laughable that some of the staff responding to the article believe it will impact their main mission of protecting environment and human health. As I, and many others have witnessed, there is much fat to be trimmed and whilst the mission of protecting the environment and human health can in fact be enhanced whilst reducing the large scale waste and accompanying abuses. Done correctly, and in the right areas (particularly regulation), will go a long way in improving the Agency's effectiveness whilst improving the economy. If the ministers would like detailed accounts of where the waste and abuse is taking place with evidence and examples, feel free to get in touch. Although many of the most important ministers are already in possession of them. The ministers just sit there as usual and do nothing OWEN PATTERSON sort out the waste do your job. In my time at the EA over 20 close colleagues were forced to leave because of bullying. The situation was terrible and there were tears in the toilets almost every day. Some of the better managers had breakdowns. But those responsible for the bullying moved onwards and upwards within the organisation to take salaries most taxpayers can only dream about. With the exception of a few stories in the ENDS report this is the first time the lid has been lifted on what has really been going on within the EA. It’s a great site and I hope other present and former members of the EA will use it to share their awful experiences. I hope journalists will also use it to launch an investigation that is long overdue. ONWARD S AND UPWARDS JOHN? Check out HENRYS blog just click on HENRY. Looks like a lot of jobs going at the EA a shame the ones who do a good job will suffer due to EA being highlighted to the MINISTERS. Get rid of the of the ones earning more than the PRIME-MINISTER now that would save a packet.